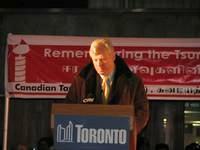 City of Toronto Mayor, David Miller, speaking. The vigil included interfaith prayers from religious leaders of various faiths across the city. Community representatives and leaders were also present at the vigil and addressed the gathered masses to offer their words of support. Ms. Pathmanathan called for a commitment to work together for the long-term needs of the affected region. “World Leaders like the UN Secretary General Kofi Annan should not be restricted by local political interferences in such a moment of immense human tragedy. We do not need local governments and their militaries to dictate the terms of the relief effort,” the CTC representative further said in her address. 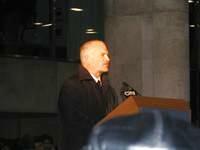 Leader of Canada's National Democratic Party (NDP), Mr. Jack Layton, speaking. Canadian politicians from all levels of government gathered there in the cold in a line up to offer words of encouragement and support. Among those that addressed the crowd include, Defense Minister Bill Graham, Minister of Human Resources and Skills Development Joe Volpe, Leader of the New Democratic Party of Canada Jack Layton, Ontario Minister of Health and Long-Term Care George Smitherman, Ontario Minister of Finance Gerry Phillips, Leader of the Ontario Progressive Conservative Party John Tory, Leader of the New Democratic Party of Ontario Howard Hampton and Toronto City Mayor David Miller. Also in attendance were federal parliamentarians Gurbax Malhi, Jim Karygiannis and Maria Minna, Provincial Minister of Transportation Harinder Takhar and over 10 city councillors. Community leaders and representatives and organizational representatives were also present at the event. The 8th of January was declared as a national day of mourning for victims of the Asian Tsunami disaster by the Government of Canada. Memorial services were also held in Ottawa by the Federal Government which was attended by Canadian Prime Minister Paul Martin and Governor General Adrienne Clarkson. Approximately 400 people were in attendance, media sources in Canada said. The Provincial Government of Ontario also held a memorial, led by Ontario Premier Dalton McGuinty. Approximately 200 people showed up for the event, media sources further said. 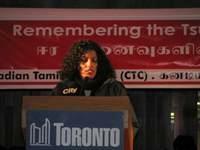 CTC Representative, Ms. Surendini Pathmanathan. 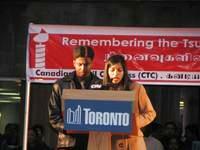 Masters of Ceremony, Neethan and Manjula.